An advertisement for the Kensington development in Great Neck by the Rickert-Finlay Realty Company from a 1916 issue of Country Life in America. Click HERE for more on Kensington and click HERE to see some Kensington houses. "Delightful neighbors of your own sort on every side, and inflexible property restrictions." Imagine an advertisement that said that today. 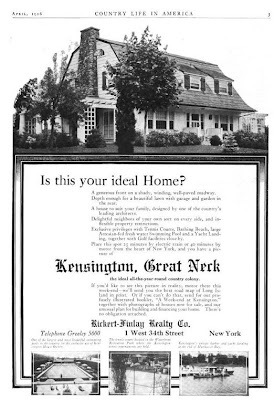 Not my dream house, but it is exactly the sort of comfortable 1920's Dutch Colonial with nice porches and pleasant details that my grandparent's built---just before the great depression, poor dears. On another note: Zach, how are you finding these country life pieces online? I can't get google books to give me Country Life?